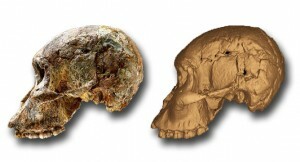 The cranium of a South African australopithecine (Sts 71) as original (left) and virtual copy (right). Note that the geometry can be captured accurately but color and texture information is lost during data acquistition using computed tomography. The first step to Virtual Anthropology is to obtain a digital representation of a real object, mostly 3D, or 4D if time is included. For surface measurements, different technologies such as laser-scanner or stripe light scanner can record the complete surface. Additional data resources in VA are histology, photography and motion capturing technology.